For the most part, Canadian automotive needs have been served by whatever the guys are selling in the USA -- Canada is just treated like the 51st state...which is fine because the USA has always had a varied and interesting offerings from many OEMs. 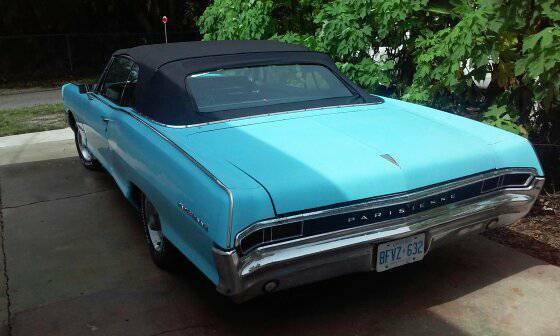 However, in 1959 the Canucks got their own headlining Pontiac, something called the Parisienne, that had all the sophistication of a Paris coffee shop, but room for a dead moose carcass in the trunk. 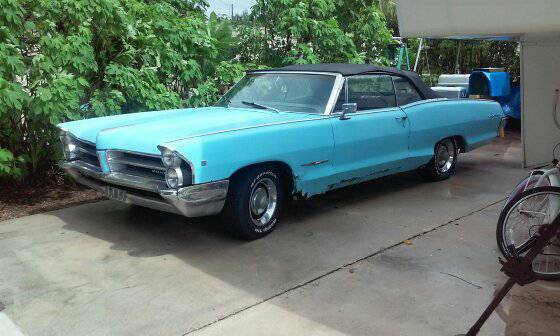 Find this 1965 Pontiac Parisienne Convertible offered for $4,500 in South Ft Myers, FL via craigslist. Tip from Dascpcu. If you think the Parisienne looks familiar to US car buyers, that is because it was just a Pontiac Bonneville with a slightly different grill, a few badges, and Chevrolet powertrain instead of Poncho...this one looks like it might have a case of the old tin worm, but the seller claims that the hood/trunk/floorpan/frame are all rust free. Yup...that is an engine. 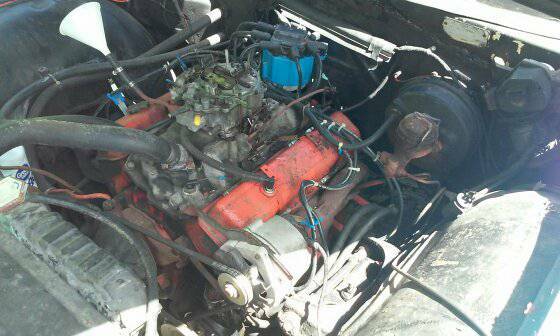 The seller doesn't mention which V8 we are looking at, because it could be any number of Chevrolet V8s -- 283, 327, 350, 396, 409, or 427. It looks big blocky to me, but perhaps a reader can give us a positive ID. My father once did a burnout all the way through a McDonald's drive through in one of these. Oh cool! 4000lb of sheetmetal welding practice! How did they get the 'That 70s Show' set for the first picture? I'm not convinced the body wouldn't slide right off the chassis when it was winched onto the transporters bed. And you don't want to see my welds...they make superglue look like a better option. I'm still going through KBZ's and others' posts the other day. That guy with the big collection will get a call after I get off my long work stretch and I can check them all out.